Mayotte (FH) is a French overseas department located in the northern part of Mozambican channel in the Indian Ocean is one of the four major islands of the Comoro group of islands, but it does not belong to the Union of the Comoros (a DXCC country D6). It's area is about 400 square km (i.e. a bit smaller than the city of Prague). Its population is about 200 thousand people. The highest mountain is called Benara, about 660 m a.s.l. The official language is French, but some people speak Shimaor. As it's a French territory, the euro is used as currency despite it being over 7000 km from Europe. Why Mayotte? The idea to make an DXpedion to this DXCC country came up on the journey from another expedition to D6 in 2016. We learned how the waves “work” in this part of the world so we knew what propagation we could expect considering also the current phase of the solar cycle. Since our next DXpedions was to Mauritania (5T5OK) in 2017, FH had been postponed to the future. However, it turned out that the “future” was not that far away. We spent almost all of June looking for a QTH which turned out to be unexpectedly difficult. 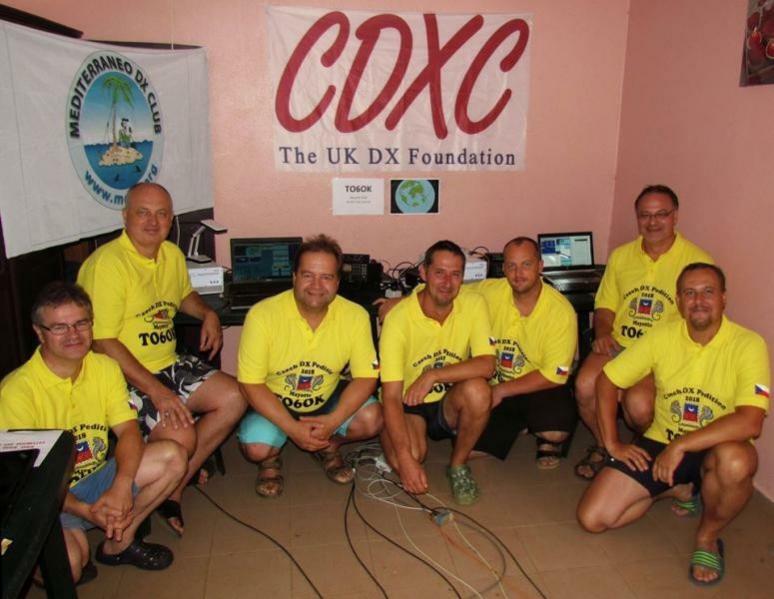 Only after that did we understand why no major DXpedition had taken place in FH for so long and why it's even not activated in the major WW Contests. The problem was the place for erecting larger antennas. Eventually we had chosen the village Mliha which is not optimally located, but it offered enough space for our antennas. July was marked by preparations for the rig setup. Everybody was given a task to put together one station so it could be used for all modes (CW/SSB/DIGI/FT8). We prepared four K3's, one TS590SG and two TS480HX's. One of them was a backup in case of any failure. The rig also included six Microhams MKII set up for the relevant modes. We intended continuous traffic from 160 to 10m with six stations and five 1kW PAs. Unfortunately we weren't granted the license for the 60m band and we also gave up on the 6m band due to the current propagation conditions. The antennas were the same provenonesas in the previous expeditions D66D/5V7P/5T5OK/Z66D. The only improvement was a 4SQ at 30m instead of the simple vertical. The rig preparations were completed by the beginning of August so we could start the packing things together. We completed the packing and plastic wrapping of all baggage at the pre-expedition meeting on September 8th at Peter's place in Ritka. We also discussed the general strategy, cleared all details, and finished the setup of the sixth station. After the meeting OK2ZA took all five bags with antennas and masts to his QTH from where we were leaving for the expedition on September 19th. OK1BOA, OK1FCJ, OK1GK a OK6DJ met in the late afternoon at OK1FCJ's place in Ritka and set out to Moravia to Ruda's (OK2ZA) place. OK2ZC and OK2ZI were already there so the team was complete. The DXpedition started officially before midnight. We ate goulash, discussed the last details and checked the baggage. The entire weight of all materials was 450 kg. Nr..2, OK1GK with OK2ZC the 4SQ for 40m and vertical for 80m. OK2ZI and OK1FCJ went to the town for shopping afterwards. We decided to cook as we had a kitchen, fridge, freezer and microwave. Around noon a police patrol came around asking who we are and what we were up to there. They checked our license and rental contract. All was OK so they gave us a couple of useful pieces of advice and left. Our QTH was at the end of the village. There was just a small scuba diving club behind it and then a smaller military base. The soldiers passing by said hello to us and informed us that there's a permanent service even with a medic on their base in case we needed it. We hoped not. We worked on the antennas the whole day. OK2ZI erected the multiband vertical dedicated to FT8 in the backyard. OK1FCJ set up the Spiderbeam Nr.3 and the day was finished by putting up the 80m INV VEE on a palm tree. We were tired in the evening, nevertheless we started our operation. At 7pm David OK6DJ (as usual on the other expeditions) called the first CQ on 20m CW and the first station Lada, OK2PAYwas in the log. Petr OK1FCJ started on 40m CW, but he had to stop after a while as the neighbor's cows decided to go for their dinner to the place where the 40m 4SQ was standing. We were afraid that they may get tangled up in the guy ropes and radial wires and we tried to chase them off, but without success. Fortunately the owner appeared and lead them away. Karel OK2ZI and Ludek OK2ZC tried the 30m and 80m CW with the multiband vertical. We tested the 80m SSB into the INV VEE later, but the antenna did not work. It was a task for the next day to get it work. After about 500 OSOs we went to bed to get some well deserved rest. We got up early again. After breakfast we ran on 20m, 17m and 15 m CW. The rest put up the 30m 4SQ a couple of meters off yesterday's high tide limit. However, some people passing by alerted us that the day's high tide would be much higher and our antennas would be standing in water. Therefore we extended the fiberglass rods by 1m and moved the entire system off the highest possible tide. It was noon and we ate an excellent lunch cooked by Karel, OK2ZI. It qualified him (to his bad luck) to the cook position for the rest of the stay. We managed to finish the third Spiderbeam in the garden, tune INV VEE to 80m SSB and match the vertical for the 80m CW. Then we had SWR better than 1.3 on all antennas – we are satisfied. Although we planned 2 VDA's we put up only one for 17m for the time being. We gave up erecting the 160m antenna for the moment as there were lot of people and kids on the beach. We postponed it to Sunday afternoon. The propagation was very bad, no stations on 10m and 12m at all. As our SSB stations were already active we did a little research about the interference between the bands and tried to find out the best antenna and bands combination for inband traffic. Although each station was equipped with the band pass filter there was still some interference between certain bands. Towards the evening the 40m and 30m bands worked quite well. On the other hand 80m did not open before dark. The 30m and 40m closed at about midnight, with no response to our CQ at all. We saw an aurora warning in the propagation forecast which boded ill.
Before we could erect the 160m antenna we had to repair the 30m 4SQ because the high tide had loosened one of the ground spikes which caused one of the masts to fall down. After that we erected the 160m vertical at last. It required all of us to participate except Petr, OK1BOA who didn't feel well and stayed in bed for the rest of the day. The 160m mast was 18 meters high with capacitance hat. The SWR was not quite ideal, but we left it so for the first night. Ten radials were laid on the wet beach and weighted it with stones. The difference between high and low tide was about 3 meters, but as the beach was very low-pitched the sea moved back over 100m at the low tide. We also had to move the multiband vertical to the beach. We put up another VDA for 12m next to it as none of the Spiderbeams had a good SWR on 12m band. The last antenna was 240m beverage to EU. OK2ZC and OK2ZI pulled it through the banana grove. We were testing all possible bands over the day and experienced even the opening of the 12m band. It gave us hope for better propagation although SFI was 67. Monday was supposed to be the first “full activity” day. We logged the first 50 QSO on 160m band at night including three W stations. The beverage worked very well. We were missing the DHDL RX antenna for JA, though. It was planned for today, but...We found out that the 30m 4SQ didn't survive the night. The high tide had loosened the same ground spike as before. We fixed it again and put more stones on the radials hoping that this would survive, but mother nature proved us wrong the very same day. We worked on higher bands until noon and thanks to a good antenna placement we were able to work inband on 20m, 17m and 15m in any mode combination. That was perfect, we could use the openings at maximum. We also worked FT8 mode either together with CW or SSB or at the band opening/closing when the signals were too weak for other modes. We had good propagation to EU and AS, but NA and SA suffered due the hillock west of our QTH. As we were receiving the first complaints about the low number of QSOs to NA we realized that it was a problem. We had less than 5% of QSO to W. We tried to call specific CQ to NA every afternoon, but undisciplined stations from EU (including many OKs) made our work difficult. In the afternoon a tidal flow higher than before had come. The 160m vertical stood in the water although we thought we had placed it out of the highest surf, but it held up for the time being. The 30m 4SQ was much worse. Three mastshave fallen down. There was a lot of garbage like plastic bags, ropes or branches entangled in our radials and guy-wires. We had to pull them out of the water and clean everything up. The next day we wanted to find a safer place for it. We checked the 160m vertical at low tide in the evening, but it seemed that the mast survived without any damage. Unfortunately we couldn't say the same about the radials. Some were even gone, some were so entangled that they couldn't be loosened any more. Fortunately the salt water itself renders a good ground so the loss of some radials didn't play that big role. The vertical with the elevated radials seemed to work. We made further contacts on the topband. In the morning we rolled up the radials and left them at the vertical base. Although they were at about 2m we didn't want to leave the wires stretched over the day due to people walking across the beach. This procedure became routine till the end of the expedition. The propagation was quite good on this day considering the poor solar cycle. All bands including 10m were open over the day. We made a short QRT at noon and Karel OK2ZI served another of his excellent lunches. Lunch was the only time we could rest a bit, relieve our ears of the headphones and talk shortly. We worked all night on 160m and 80m. We also tried 40m, but neither SSB nor CW worked on this band. VK2IR asked David OK6OJ for a FT8 sked on 20m. David went out to turn the antenna using his mobile phone as a torch. As he got to the mast a guy jumped out of the bushes, attacked him with a cudgel and knocked the phone out of his hand. David had been taken by surprise. He hesitated a couple of seconds what to do, but then he decided probably for the best solution. He quickly picked up the phone and ran back to the house. He managed to make the sked with VK2IR at last, but it was the first very unpleasant experience on the island. It was as if this incident was a sign of further troubles. Two days to the start of CQWW RTTY Contest. All antennas were tuned and ready except for the 80m vertical which was still tuned to the SSB band. We prepared two shunt pieces over the coil to shift the resonance to 3.600 MHz and 3.750 MHz respectively. The antenna was prepared for both SSB and RTTY now. The bandwidth of all verticals was amazing in this environment. We could cover 300 kHz on 80m with only two settings with the acceptable SWR, but we wanted the SWR better than 1.2 hoping that it would reduce the mutual interference. We tried to call on SSB and CW just to test it, but with no response. The landlord came in the afternoon to tell us that there would be a big party for about 100 people in the garden just among our antennas. We were astonished as nothing like this had been announced or negotiated before. It could be very dangerous for the people to move among the all guy ropes and wires. We tried to discuss with him, but to no avail. We gave up one day of the traffic as we wouldn't be able to read weak signal in the loud music, anyway. But that was not all. Local municipal police came later to tell us that the property we had rented was actually not private land, but belonged to municipality and no antennas are allowed there without a special permit. We managed to get the contact to the responsible person at the city hall, but the communication was difficult. Eventually they referred us to the prefecture in the capital city on the other side of the island. Early in the morning OK1FCJ and OK2ZI were getting ready to go to the city to negotiate with the prefect, but before they left an army officer had come and told us, that the 4SQ antenna behind the fence was the on the army property and must be removed immediately. We dismantled the antenna to avoid another conflict and made a simple dipole to hang on the palm tree. It was about 15m high and worked quite good, but the long path to W6/W7 in the afternoon was not possible any more. We were nervous about the result of the negotiation with the prefect. After a couple of hours the guys returned back with no result. There was a strike in front of the prefecture and nobody was working there. In the meantime the state police came up. An officer told us with broken English that the permit for building the antennas we've got had been issued by an unauthorized person and if we don't get a new valid permit all antennas must be removed before Monday. In the high emergency we contacted our friend Wil F4ESV, explained to him our situation with the authorities and police and asked for advice how to proceed. Wil acted immediately. He called the local authorities and explained to them what the ham radio was about, that we posed no danger and that's a hobby. He managed to obtain a verbal assurance that the prefecture would issue the right permit for us on Monday. We started the CQ WW RTTY Contest at 0000 UTC. We ran multi-two category. We began on 80m and 40m, but no response neither to our CQ nor to our calls of other stations, although we heard a lot of stations from EU and NA. They made QSOs with each other and didn't turn their antennas to Africa. We logged just a few QSOs in the first couple of hours. Some improvement came in the morning with opening on 20m and 15m. However, even these bands didn't last over the day. We again experienced the drop outs as in previous days. While two stations ran the RTTY the others were trying CW and SSB and even FT8 as the last resort. Before noon the garden party participants were coming and installing the music systems. It was clear that no CW nor SSB was possible any more due to high noise so it left us with the digi modes. The party lasted till night time. We were not very successful with the RTTY Contest. We left the 15m band in the evening and worked on 40m where the directions to EU and JA were open. However, we had only one thousand QSOs in the log after the first day which was much less than we had hoped. The 40m band closed about midnight. There were just a few callsigns in the log in the last couple of hours. The propagation got better on the lower bands in the night on Monday. We logged further W stations on the topband. As we made only about two thousands contacts in the CQWW RTTY Contest we decided to continue RTTY in the following days. We all were nervous about the result of Wil's negotiations with the local authorities. We called him after the breakfast and he informed us that all was still in progress. The municipal police appeared again. We told them that the things were being resolved. They called Wil who was trying to explain all details to them. To make things even worse, a woman from the neighborhood came up and complained about our beverage antenna in her banana grove. It was very hard to talk to her as she spoke neither French nor English. We used our arms and legs to communicate. Eventually we agreed on a “bribe” 100,- euro to settle the thing. She left apparently satisfied. We continued running on 20m, 17m and 15m. After the lunch we took a couple of group pictures for the media and returned back to our stations. There were over four thousand QSOs in the log. It was not bad, but still less than we had expected if we took into account the number of antennas and rigs. We couldn't do any better, though. It is simply too far from FH to any other part of the world and the propagation was not good. The operation continued routinely. OK2ZI and OK2ZC did their best on 160m and 80m, Petr OK1BOA on 20m and 40m. When the propagation didn't allow SBB any more he switched to FT8 and went on till the bands closed. Only after that he got some sleep. OK1GK (who usually didn't operate at night) got up almost at the same time. We had an opening on 17m and 15m in the morning and on 12m and 10m in the afternoon. After the lunch we shortly discussed the process and order of dismantling antennas and stations. We worked out a detailed plan of which stations would be dismantled on Friday and which would run till Saturday morning. The last antennas had to be easy to take down as we were leaving for the airport on Saturday at 11 am. The last day of the full scale operation. The night shift went to bed early morning. There were a couple of new contacts on the lower bands in log. The day shift consisting of OK2ZA, OK1GK and OK6DJ started on 30m before closing and then continued on 20m, 17m, 15m and 12m. 20m band was working very well today, but other bands were poor. It just confirmed our experience from the previous days. Much more frustrating was that tens of stations were running FT8 although their signals up to S5 would be good for brisk CW or SSB. We were calling CW and SSB and selfspotted us in the DX cluster but to no avail. After ten empty minutes we switched back to FT8 and we got a pile-up almost immediately. A nice surprise had come in the afternoon. After the poor morning when we made less than a thousand QSOs the higher bands opened again. We ran on 10m/12m/15m/17m simultaneously with all six stations of ours. Even the reserve station equipped only with TS480 (200 W) without PA had a good CW pile-ups. The number of QSOs was increasing rapidly. The 20m band stayed open longer than usually and we had a good propagation to W at long last. If the propagation like this had been every day….We were looking forward to the night as we hoped that the propagation on the lower bands would be better, too. We started the night on 80m and we were not disappointed. We logged a lot of EU stations including OKs who couldn't hear us in the days before. This log entry wouldn't be here if the things went as they should have, but Air France decided otherwise. The foursome departed from Paris in the morning. All our baggage were supposed to be on this flight, but only six pieces arrived to Vienna. The same situation as when we arrived from the previous DXpedion in 5T. All they could do was to write a complaint. They all traveled from Vienna by a van to the QTH of Ruda OK2ZA and then further home by their cars. The DXpedition was over. BTW the lost baggage had been found in Hamburg (where it was sent by Air France) and didn't arrive until Thursday. What to say at the end? It was a really good expedition. Although we didn't reach our secret dream 50000 QSOs we got close to it. It was partly due to our QTH closed to NA direction, partly bad propagation in the context with the current phase of the solar cycle and also the limitations caused by the “garden party” at our QTH and problems with the local authorities. We might have chosen the wrong strategy when we ran the CQ WW RTTY Contest in the multi-two category. Of course we won the contest in FH, but it was counterproductive from the number of QSOs point of view. On the other hand we can be satisfied with our rig and antennas. Everything worked perfect. No need to take out the spare TRX. All antennas worked also very well, although we spent more time with moving and rebuilding than we expected. There was no industrial QRM at all (very positive! ), the 230V mains was strong and stable. We had only one little 15 minutes blackout which was very good for Africa. We'd like to thank all stations for the QSOs, all sponsors (we wouldn't be able to realize such DXpedion at all without them) and the last but not least we thank Wil F4ESV for his help in the critical moment of dealing with the local authorities. We're looking forward to our next Dxpedion. There will be one for sure….but where? RX antennas – DHDL for JA, 240m beverage to NA and EU.